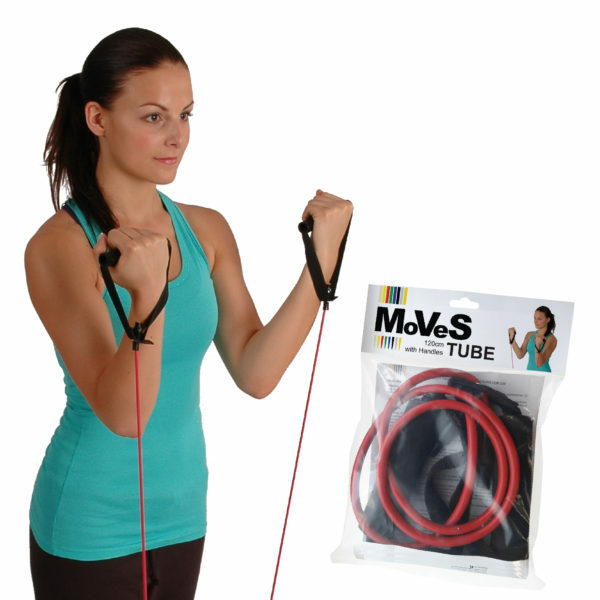 The MoVeS Tube is a high quality exercise tube created by an intensive dipping process. This dipping process guarantees a multi-layered tube, hence resulting in a strong and safe training product. In contrast, extruded tubes are very susceptible to damage and can easily snap. Multi-layered dipped tubes are much more resistant. In general, a dipped exercise tube is even more durable than a band, especially when used on a coarse surface. MoVeS Tubes are available as a ready to use product – 120cm length with handles straight out of a polybag – and in rolls – 7,5m or 30m packed in a nicely designed box. Above all, MoVeS Tubes with Handles are very useful for physiotherapy and muscle training. With these high quality and very resistant tubes you can train all muscles in your body and improve body flexibility. The lighter resistances are perfect for physiotherapy or a light work-out, while the highest resistances will even convince the more trained athlete. – a pair of handles attached to a quality resistive tube of 120cm. – a light set: 3 tubes of 120cm (1x Yellow, 1x Red, 1x Green) + pair of interchangeable handles. Also available as MoVeS F!T.